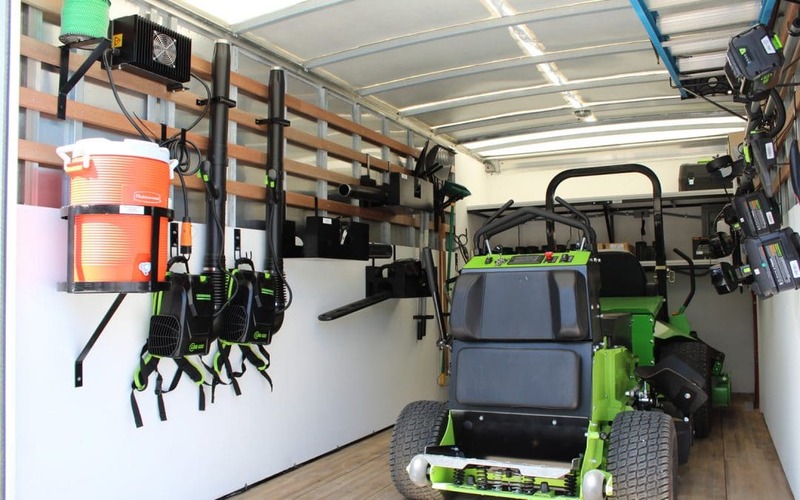 Landscaping and lawn care crews can save considerable time and money with innovative truck storage systems that make it easier to store, find and retrieve a long list of equipment, tools and everyday landscaping supplies. Many of the Super Lawn Trucks storage solutions feature all-steel construction, helping them stand up to the rigors of everyday commercial use. They are also designed for easy installation so crews can begin organizing tools and saving time immediately. DOWNLOAD BROCHURE & ORDER FORM detailing each of the innovative, time-saving storage solutions from Super Lawn Trucks. Tool organization is a great way to begin saving time in a landscaping or lawn care company. When tools and supplies are well-organized and properly stored, employees spend less time looking for the things they need before heading out into the field. That reduction in unbillable labor goes straight to a company’s bottom line. Ask yourself this question: How much time do my employees spend looking for tools and supplies? Is it 6 minutes? 10 minutes? More?! Just how much money am I wasting? Along with increased employee productivity, there are many other benefits to proper tool storage and organization. Theft prevention – Secure tool storage inside of a box truck prevents tools from being stolen while parked and left unattended. Improved safety – Tools and supplies that are securely stowed inside a box truck won’t get tossed around in transit. They are also less likely to create tripping or other safety hazards as a result of being left lying on the floor. Longer tool life – Tools that are securely stored last longer because they don’t undergo the same kind of wear and tear. Increased employee accountability – When systems are in place to properly store tools, employees are more likely to take better care of them. Increased employee satisfaction – When systems are in place to enhance organization, the entire culture of a company can be transformed, helping to instill a greater sense of pride and passion among employees. To begin reaping the benefits of smarter tool storage, visit superlawntrucks.com/online-store and scroll down to the “Hand and Power Tool Storage” section.